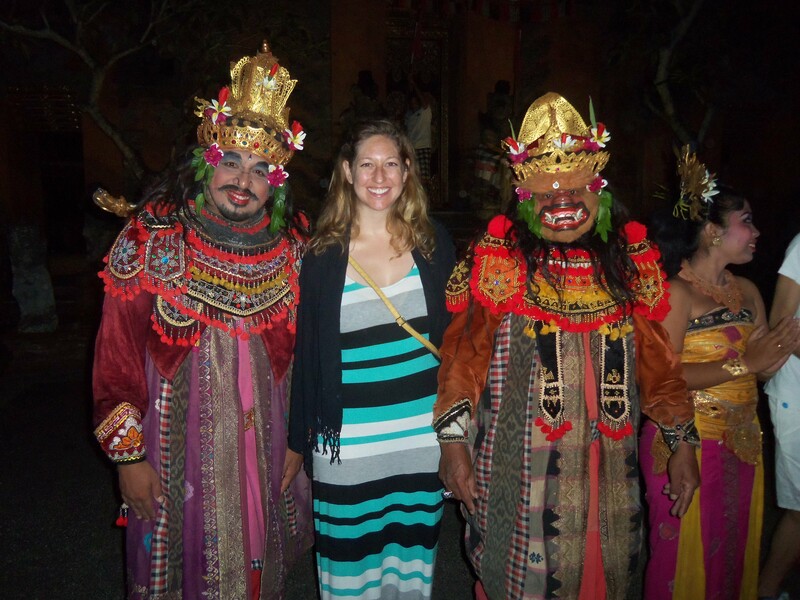 Today’s post is from Nicole Korpell, a kindergarten teacher in Woodland, CA who just wrapped up a month-long journey throughout Southeast Asia. 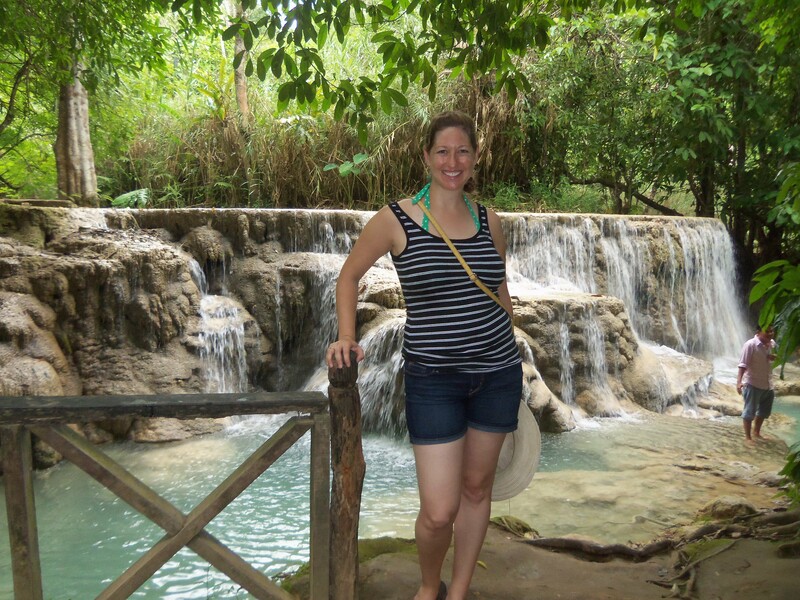 In between visiting Cambodia, Laos, Thailand, and Indonesia, she stopped at a Buddhist meditation center for a silent retreat. The experience was not quite what she was expecting! Here she provides an account of her adventure, in full detail. Take it away, Nicole! Please note: The author highly respects Buddhism, its teachings, and the International Buddhism Center. She is grateful for the opportunity to have participated in the Meditation Retreat Program. Well, it turns out, about 3 days. 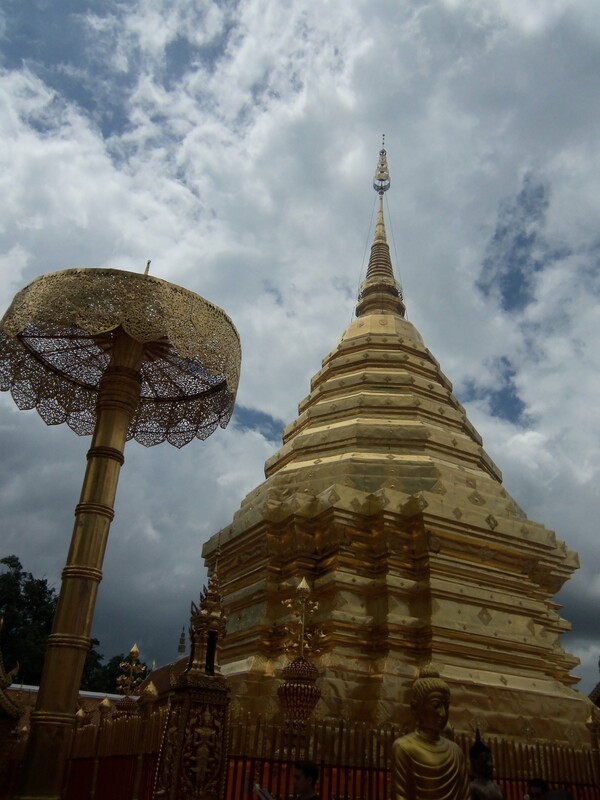 I left my luxury hotel in Chiang Mai on Sunday, July 5. I took one of those red trucks that was converted into a taxi by adding benches and an enclosure to the bed of the truck (very safe, I’m sure). I was the last to be dropped off, driving past past “Born 2 Sleep” (my kind of store!) and Chiang Mai’s College of Dramatic Arts (who knew??) along the way. After a windy, one hour trek up the mountain, we arrived at Doi Suthep, a temple famous here, and where I would be spending the next 4 days. With cross-body bag, tote, and rolling suitcase in tow, I inquired about the retreat course. No one had any idea what I was talking about. Someone told me to go buy a ticket, so I handed over 50 Baht, the equivalent of about $1.50, and got in line for what I thought was an elevator. It turned out to be a cable car on a steep incline. Tourists whispered behind their hands and looked over at me. Did I make a mistake? Was this where I was supposed to be? After climbing and descending several sets of stairs, following arrows that only led to more arrows, and navigating some sort of system that looked like what the seven dwarves used in the mine–a little cart on a track–I found my way to the office, sweating and spent. I was greeted by a monk who checked me in. I signed in after Oliver* from Germany, who arrived the same day but who would leave a day later. The monk gave me my room key and directed me toward more stairs. A steep decline down to the second building. I was grateful to see bottled water was provided. 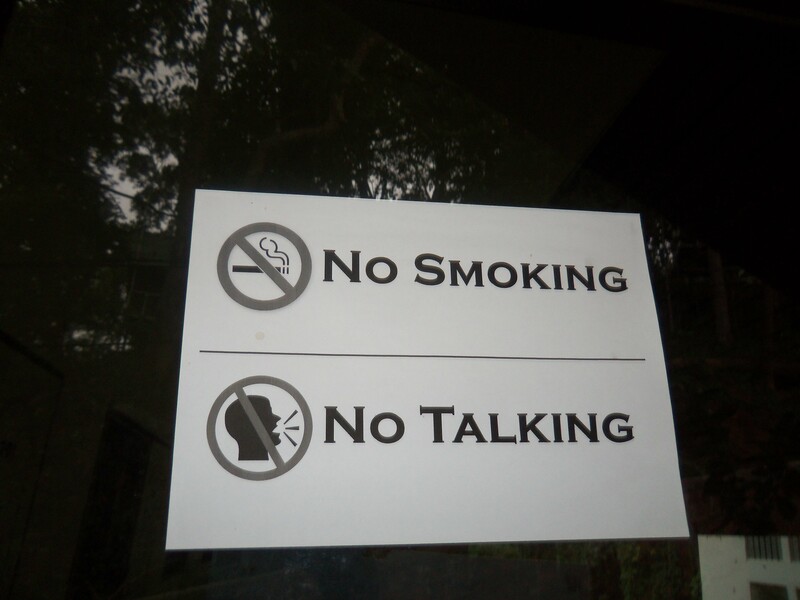 There were also lots of signs that read “No smoking” (no problem!). And under that, “No talking.” Uh…Not even a little? I had read in the rules that “chit-chat” was not allowed, but surely we would share our experiences, right? Talk about our meditating? Or, do the usual exchange of travelers: Name, where you’re from, where you’ve been, where you’re going, how long you’ve been in Asia… I started to get nervous. When I made it to my room, I was relieved. Yay! My own room! I had thought I would be sharing. It was sparse, with a thin pillow on the floor for seated meditation, and a bed–a pad on a wooden board with decoration at the head and foot of the bed. A single light bulb (CFL) hung from the ceiling. Great! 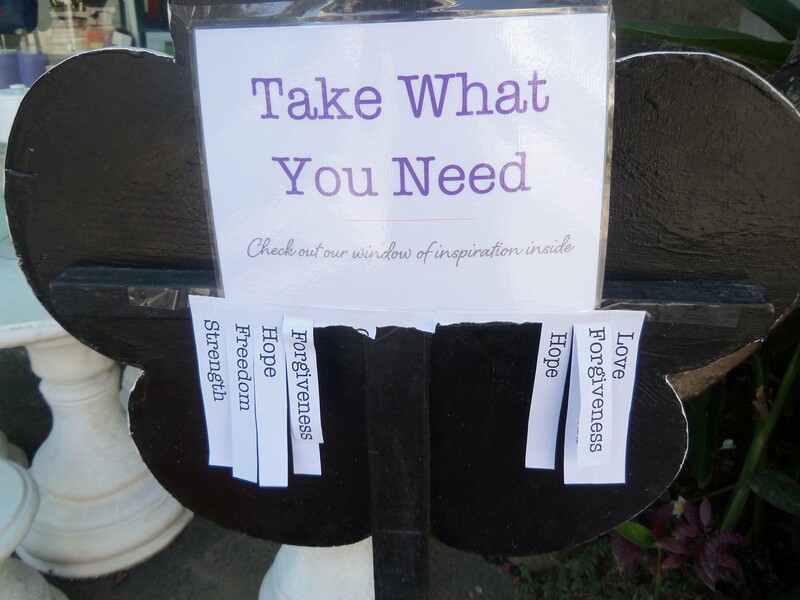 Just what I need! I will get some good meditation done here! My smile started to fade, however, when I went to the shared toilets. Clean enough. Bugs everywhere, but I can handle a little nature. I looked in the little stall. No toilet paper. No wastebaskets in the stalls, like you see in Southeast Asia in the places where you can’t put toilet paper in the toilet. With rising panic, I checked the other two stalls. Not even an empty toilet roll holder! What did people use here? I saw the little hose next to the toilet that I had seen in Cambodia and Laos, but I thought that was for cleaning the toilet. Could I have misunderstood? Was I supposed to clean myself with that water? That didn’t make sense. How would it dry? The uniform is white shirts and white pants. Wouldn’t wet white pants be a problem? I had my trusty Charmin travel roll with me, but that wouldn’t last me four days. I would have to use it sparingly. Like, REALLY sparingly. At least there was a bar of soap next to the shared sinks (small victories)! I went for my orientation with Oliver, as we were the newbies. He looked like a white version of the rapper/singer/actor Common, with the best posture I’ve ever seen, even when sitting cross-legged. We met the monk (our teacher) and did the opening ceremony, which included chanting, prostrating, offering trays of flowers, and lighting candles. It felt very authentic, but I was jealous Oliver got to light TWO candles and I didn’t get to light any (was it because I’m a woman?). The main monk went into his room, and the younger monk taught us basic versions of sitting and walking meditations. He would teach us steps one and two today, adding a step each day we were there. We practiced and then dutifully went off to meditate. I chose to go upstairs to the meditation hall. I could see from the sandals outside that a few people were already inside. I added my shoes to the pile and chose a long strip of carpet near the door where I could practice my walking meditation. I took three thin pillows for my sitting meditation. After twenty minutes, I needed a break. I saw an approachable-looking woman on the stairs using the Internet on her phone to book something. I thought we weren’t supposed to use phones! Well, she must have been here a long time and just HAS to use it right now, I decided. I whispered, “Excuse me. What is the toilet paper situation here?” She looked up and laughed. “It’s tricky,” she said with a German accent. “You will need to buy it at the shop. But the shop is closed for today. It opens tomorrow in the morning.” Okay. I thanked her. Interesting that this hasn’t come up at orientation. Chanting practice! My chance to shine! Oliver, the young monk, and I sat in front of the main monk with our chanting papers. The foreign words seem to have been written phonetically, with lines over letters that are held longer. I tried to match the monks’ pitch and follow the nuances of the chanting, up and down. “How marvelous,” I imagined the teacher monk would say to me afterwards. “We have never had so keen an ear as yours on the first day! You have picked up our chants amazingly fast!” (Does someone need external praise, or what?). Afterwards, no remarks on my musicality, but a reminder that we were to meet back in this room at 6pm to join everyone for the group chanting. I tried to appease myself with an internal pat on the back. Because isn’t that what these four days are about? Learning about and understanding ourselves? “I can do this,” I thought. No talking means no need to justify. No showing off what I already know about Buddhism by answering questions in a teacher-student format. This is good for my ego. No saying what you think others want to hear. No thinking of a response. No talking means self-reliance. Other than the toilet paper (which it was necessary to ask about), I am figuring everything out on my own. But, a couple of hours later I realize…. No talking also means no connecting, and no sharing moments. I want to TELL someone about the amazing mushroom I saw that had grown into a tree. I needed to tell someone about the irony of using my Tide To Go pen on a tiny stain and then making an even bigger mess, so that we could laugh about it. 6:00 pm. Chanting as a group. We looked so funny, all dressed in white, trying to read along in our booklets, in foreign words while sitting criss cross applesauce and trying to match pitch. I liked the chants so much that they would get stuck in my head over the next couple days. The chanting went on for an hour, with a little sitting meditation thrown in, as well as lots of prostrating to the Triple Gem–the Buddha, the Dhamma, and the Sangha. Then, finally, we could get ready for bed at about 8:30pm. I was exhausted. I washed my face, brushed my teeth, and covered myself in insect repellant. Lights out. 5am my alarm goes off. Why!? Why…. So early. Wash my face, brush my teeth, and rest just a teensy bit in bed before the 5:30 Dharma talk given by the teacher. Hearing him makes me smile. He is full of wisdom, so peaceful, telling us life lessons sprinkled with anecdotes. He tells us about people who ask him all sorts of important questions, but my favorite part is when he imitates them. “TeeeeCher…” he whines in a lilting voice. “Why am I not happy?” He expounds on the importance of balance and how daily meditation will keep us healthy. We can learn a new way of thinking positively. We may blame things on good luck or bad luck, but it is really our perspective that matters. We will have both happiness and sadness in our lives, and it must be so. We must accept and let it go. Someone clangs the bell for breakfast at 7:00am. We walk mindfully yet quickly to the dining area, as many of us have not eaten since before noon yesterday (as is the way of the monk and one of our rules here). I don’t know what I was expecting, but I must admit I was less than pleased with the “spaghetti” in watery red sauce with indeterminate soy meat-replacement and white beans. I twirl my spaghetti around my fork, thinking 1) this doesn’t seem very Thai, and 2) Red sauce for breakfast? We’re all wearing white! I try to make breakfast last as long as possible, scooting the soy lumps to the far side of my plate. I spy two gentlemen with a few rolls of toilet paper. “Is that the store? ?” I whisper to the woman I spoke to yesterday. “No,” she whispers back. “It’s right there.” A small part of the room has its own door and windows, and, though it’s dark, I can make out the pyramid of toilet paper. The German woman thinks it opens at 8:30. One can only hope. I follow the others to wash my plate and fork, and then head to my room for an unscheduled (and not allowed, as far as I know) 15 minute rest in my bed. My 5am wake up call is catching up with me. After laying down, I walk upstairs with my trusty timer. I muster enough energy for 15 minutes of walking meditation and 15 minutes of sitting meditation. I rejoice when I find it is 8:30. I head down to the store. It’s open. I buy TWO rolls of toilet paper. It’s like Christmas! I can use as much toilet paper as I want and no longer need to ration! Meditation. Another break. I sit and watch the leaves. I spend an inappropriate amount of time watching bugs. I’m finding the actual meditating is hard, but doable. It’s the thinking about meditating for the next several hours that is paralyzing. According to the rules, we are not to read, write, listen to music, or email. We are to have no distractions so that we may focus our attention on meditating. After all, that is why we are here, no? Finally chanting comes. I revel in the shared experience, and get to use my vocal chords. After about an hour of chanting, the teacher gives a talk. Next, meditation and then (finally!) get ready for bed. I plan to take a nice, hot shower. The bugs and sweat make me feel icky. I get ready, lug my stuff to the shower stall, and hit the button. Nothing. I try to turn various knobs. Nothing. I see the German lady and ask her what I’m doing wrong. Nothing. It doesn’t work. Well I’ve come too far not to take a shower now. I go into a different stall. Freezing cold water. No knob you can turn to “hot” as with the other one. I remember being annoyed that earlier a woman from a different building had come to use our shower and to wash her clothes. She must have used all the hot water! Not feeling very Buddhist towards her, I soap myself up and brace myself for the rush of cold. At least I was clean. I’m exhausted. And hungry. The food keeps going right through me. I’m super over the bugs and the enchanting animal sounds. I want to sleep in, eat what I want when I want, have a hot shower, do laundry, and pee next to a huge roll of toilet paper on a holder attached to the wall. I am so grateful that I will have these things soon. I need to keep moving during the 5:30 Dharma talk as otherwise I fall asleep. I can barely keep my eyes open. Oliver comes and sits at my table for lunch. We have been flirt smiling as romance is not allowed (and not why we are here). I also haven’t seen a mirror in days. Still, I can’t help myself from fantasizing about going to his room late at night to break the rules–to talk and eat. Just a moment of rebelling. My day now consists of meditating, taking a break, worrying about meditating, eating, chanting, and listening. The biggest chunk of time is between my daily meditation report with the teacher at 1:30 and chanting at 6:00. What is one expected to do besides meditate? I see people walking around. Okay, I can do that too. I meditate in different places. I use different toilet stalls. I really mix it up! I find it really hard not to talk to anyone. I crave that connection. I see more people on their phones, people reading, some talking. Is this how they stay sane? My anxiety starts to build. Is this what I am supposed to overcome in this secluded meditation center? Is anyone else feeling this way? I look to Oliver. He smiles. He seems so calm, serene, as if he was born for this. Well he’s of no use to me. Usually when I feel anxious, I talk to someone. That isn’t going to fly here. Let me be clear: We have all decided to stay here of our own accord. We are free to leave at any time. We are paying to be here, some people staying as long as three weeks. The culmination of the three week stay is a three-day retreat to your room, with no interactions or sleep, only meditation and (I believe) two meals a day. I start to count down the hours. Take a nap. This helps (as naps usually do). I meditate. By now the teacher has bumped me up to 20 minutes each. I walk, I sit, I walk, I sit, I walk, I sit. A record! Surely I deserve a huge break now. I’m feeling better. I can make it through! I wonder if others struggled on Day 3, as I did. Maybe knowing if they did or not would help. I decide to splurge and do some Sudoku. The end is so close I can taste it! Once I make it to 6:00 chanting, I’m home free. 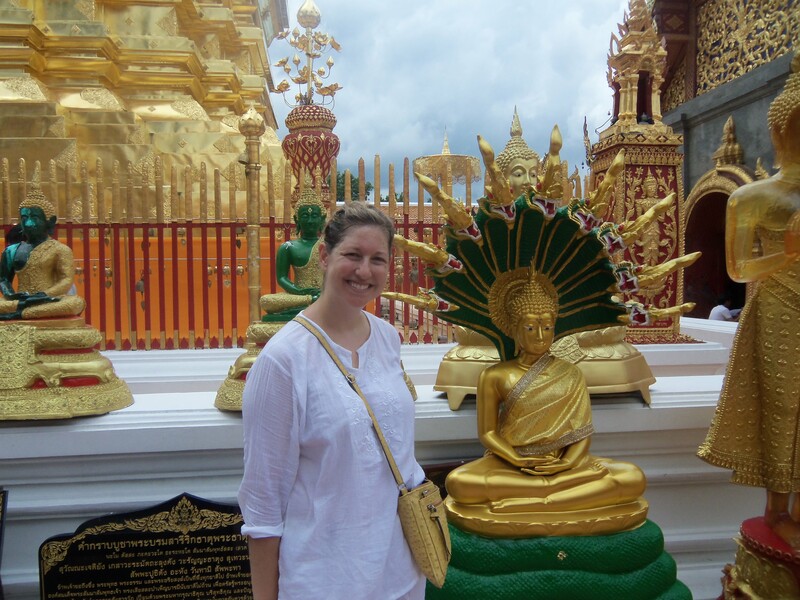 Although a part of me is bummed to hear I will miss Buddha Day tomorrow (a ceremony at the big Doi Suthep temple that tourists come to see), I don’t know if I can make it through another day. After chanting I get ready for bed. Tomorrow I might even get a real shower once I leave! I think my lights are out by 8:30pm. Waking up at 5 doesn’t seem so bad. I’m wide awake during Dharma talk. I just have breakfast, my closing ceremony, and then it’s time to hand in my key and go back to the city. As I am lugging my bags up to the office, I see Oliver. I wave to him. He comes over and helps me with my bags. We wave goodbye and put our hands together as in prayer and bow (a respectful greeting here). I turn in my key and make my donation, giddy (and sweaty) with the knowledge that under today’s whites I have on a tank top and shorts. I will shed my whites once I am out of sight of the office, like a naughty teenager changing clothes in the bushes in front of her house as she sneaks out. I see my German friend. I tell her I am leaving. 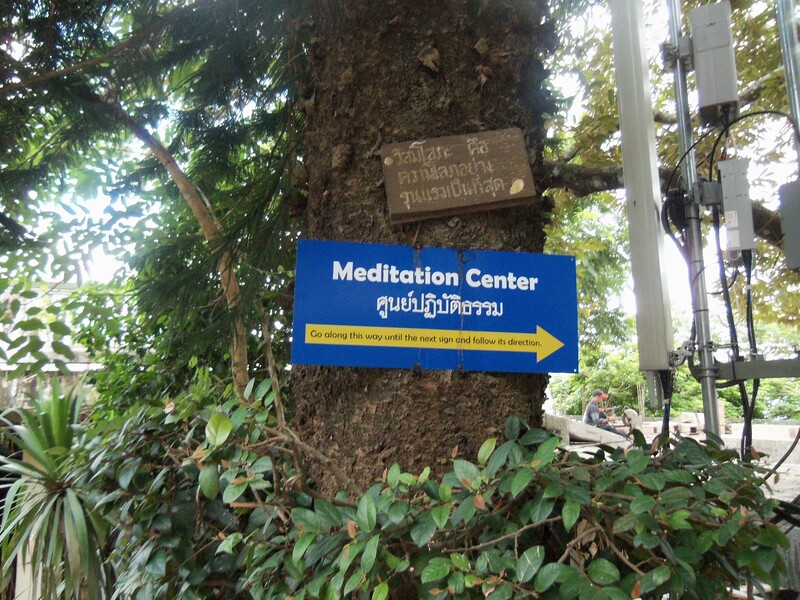 We move farther up the hill away from the office and the Meditation Hall, and talk about our time there. She has been there five days of her three week stay. I confide in her that I couldn’t make it that long; I could barely make it four days. She says she has been going nuts herself and was reading a funny book at night just to laugh. She shares that she and another meditator snuck up to the big temple one day to drink coffee and talk. I realize maybe I’ve been taking it a little too seriously, and that others feel as I do. 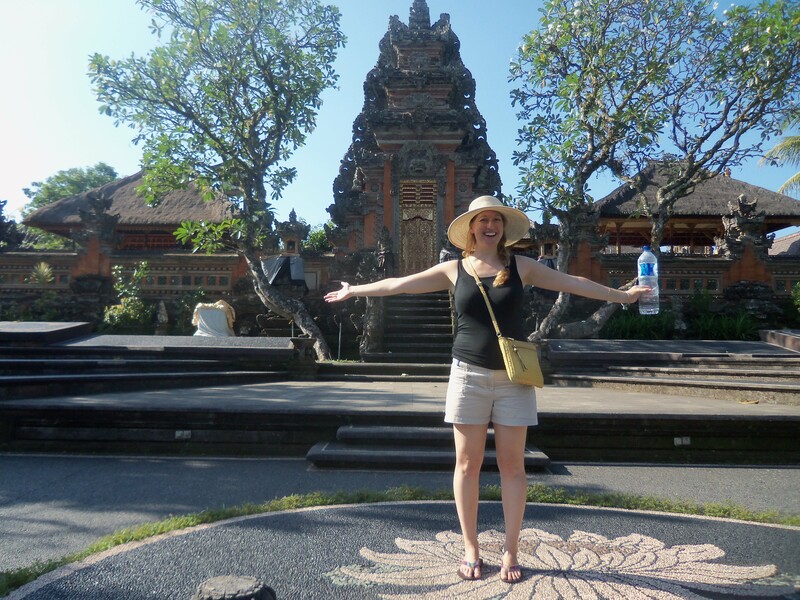 I, however, am grateful to be heading to Bali while she continues her meditative journey at the center. Thank you for your story, Nicole! For more dispatches from women charting their own course worldwide, follow @shespoised on twitter, or like She’s Poised on Facebook (and select Get Notifications from the drop down menu).